The Ravel Hotel is situated in the shadow of the Queensborough Bridge, which allows for stunningly cool photo opportunities. The hotel overlooks the East river and has a beautiful deck dining space that gives guests spectacular views. The Estate Ballroom at the Ravel Hotel seats up to 450, but can be broken down into smaller sections. And the bonus is that it features an outdoor terrace area, complete with a fire pit – perfect for your cocktail hour. Or, if you prefer a different style – you may also host your reception at the top-floor Penhouse808 restaurant which features a retractable roof. The view are even better up here – allowing guests to gaze out over Manhattan. There are several reasons to consider having your wedding at the Ravel Hotel. The full-time event staff make planning easy, and ensure the flawless execution of your event. A bridal suite is included, and of course, since it is a hotel, there are plenty of on-site accommodations, making it easy on your out-of-town family and friends. The food at Ravel is renown, with Executive Chef Seth Levine specializing in Pacific Rim delicacies. Think upscale Asian fusion. A specialty is the seafood display that includes a 3-foot sword skewered through a grilled swordfish. Other classic dishes are available of course – from fresh sushi to lobster dumplings, lamb and roasted chicken. Of course, I may be biased as a photographer, but I think of one of the top reasons to consider Ravel Hotel is its location. You simply cannot beat the views from the deck and terrace here. 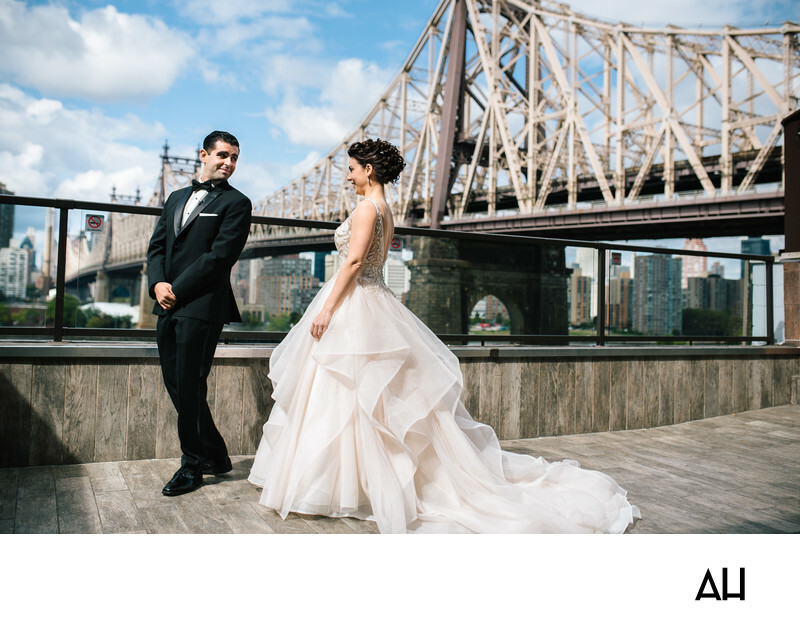 It gives you the iconic Queensboro Bridge as a backdrop for your portraits. Whether your style is classic traditional, or urban modern, your photos will be stunning. And your guests will no doubt be impressed too. If you have guests coming in from across the country, this will be a true New York experience for them, and you’ll be sending them home with wonderful memories as well as terrific photos.